It utilizes biodegradable corn-derived alcohol, biodegradable surfactants, and food grade coloring. Simply spray and wipe using Fred’s Five Star Glass Towel. This is the best liquid glass cleaner you will ever use! 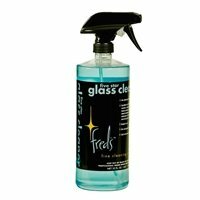 When cleaning LCD / Plasma screens, spray Fred’s Five Star Glass Cleaner directly onto Fred’s Five Star Glass Towel and then wipe screen, to avoid moisture from entering into casing. Fred's Five Star Glass Cleaner is a GREEN CERTIFIED FORMULA!! DIRECTIONS: This cleaner will not streak or smear. Use it just as it is, straight from the bottle. Appy with a trigger sprayer and wipe it off immediately to insure maximum cleaning. For best results use with microfiber glass towels available at Fred's fine cleaning center. DIRECCIONES: Use El Limpidor Directamente. Aplique Con El Spray O Limpie Immediatemente Para Asegurar Maxima Limpiza.